Item Description: “The Army and Navy, &tc., &tc.” (editorial), The Daily Journal (Wilmington, N.C.), 11 November 1864. WILMINGTON, N. C., FRIDAY, NOV. 11, 1864. See a list of the Members of the next Legislature, and other reading matter on 4th page of this morning’s JOURNAL. The Army and Navy, &tc., &tc. IT is always a matter of regret when jealousies or even possible causes of jealousy arise between different branches of the public service. It is especially a matter of regret when such things arise at a time when all the efforts of all branches are absolutely necessary to keep the ship of state from drifting upon the rocks which threaten to destroy her. We fear that the disaster at Plymouth may have a tendency to increase the feeling of jealousy between the army and navy which, we regret to believe, exists in some quarters, and even to arouse such feelings where they have not yet been manifested. The destruction of the Albemarle involved the loss of Plymouth, and of much more besides. By whose fault—if it was by a fault—was the Albemarle lost? Was it by the fault of the navy in charge of the Albemarle, or by the negligence of the army pickets? Some say one thing, come say another. We do not design now to express an opinion, farther than to say that it is natural that men’s feelings should, to some extent at least, influence their judgments, and thus that army men should lay the blame on the navy and navy men upon the army.— A full investigation might be necessary to decide all the questions involved, and that can hardly be obtained during times like these. It would be better, if a full hearing cannot be had, to have none, at least no wrangling through the newspapers. The fact is that Yankee vessels in several instances have also been struck in the same way, and one at least, a large Steamship, sunk off Charleston bar, without serious reproach being cast upon any of the Yankee naval commanders. We, however, have so few vessels, and they have been constructed under so many disadvantages, that we perhaps expect more from them than we are justified in doing, and are unduly excited by the information of any disaster to them. The disadvantages to which we have above referred press hard on the personnel of the Navy. The officers of the old Navy who resigned for the purpose of tendering their services to the South, sacrificed mere than any one can well imagine. They sacrificed a career.— They must have felt that the Confederacy had no bright hopes of promotion to hold out to them, while the United States had many inducements to offer. They must have felt themselves confined to the irksome routine of mere harbor defence, or, if going to sea, forced to adopt a mere predatory character as sea raiders, without venturing to come into collision with the heavier and infinitely more powerful war vessels of the enemy.— Nothing but, patriotism could hare prompted their course, and we feel the more bound to honor those who have obeyed its teachings, because of their contrast to those who, like FARRAGUT, DRAYTON,. DUPONT, GOLDSBOROUGH, and many others, elected to remain with the North and make war upon their own section, and, as in the case of DRAYTON, upon his own State and his own home. DRAYTON is a South Carolinian, from the sea islands, it is said. He was engaged in the bombardment of Port Royal. Thus it comes abort that, while all respect the gentlemen of the Navy, appreciate their patriotism and admire their courage and enterprise whenever an opportunity is afforded for their display, the Navy Department cannot be said to be a favourite with the people. Owing perhaps to our inadequate facilities, something is always the matter with our boats, which seem to be built only to be blown up or sunk by the enemy or by ourselves. From the first Merrimac down to the Albemarle such seems to have been their usual fate. We will say nothing about matters nearer home. It needs not that we should,—We don’t know that all or any part of this is Mr. MALLORY’S fault, or anybody’s fault, but fault or no fault, it is so. Our navy men have had an up-hill business from the first, and there are no signs of improvement. Men even begin to doubt the policy of sending out vessels like the Tallahassee to make a few days dash and then return to some port to lie supine for five or ten times as long. While the dashes made do credit to the daring of our officers and men, they have the effect rather of exasperating the enemy than of weakening his resources, or making him tired of the war. It may be said, and with truth, that the enemy is doing his worst at any rate. This is so, but we do not know whether it is a thing to be desired by the Confederacy for his strength to be concentrated, and his efforts put forth to close our main avenue to the ocean. It is the thought that recent events tempt him to make the trial—may, almost compel him to do so. Perhaps people here take a wrong view of this thing, or at least attach more importance to certain considerations already referred to, than would be done by others occupying a different standpoint. It is so hard to see perfectly straight and without bias. But right or wrong, these dashes out and dashes in are regarded with considerable distrust here by very many persons not engaged in running the blockade, while the government itself has suffered directly and incidentally by captures, to an extent likely to weigh heavily in the scale. We do not know that increased efforts of the enemy are due to the Tallahassee but it is perfectly reasonable to suppose that they are. To suppose that the Yankee government would not put an increased and more vigilant watch here for the purpose of capturing armed vessels, is to suppose sheer nonsense. No doubt they have done so. But all these considerations have reference simply to the policy pursued, and not at all to the officers engaged in carrying out that policy, which they no doubt do gallantly and well. 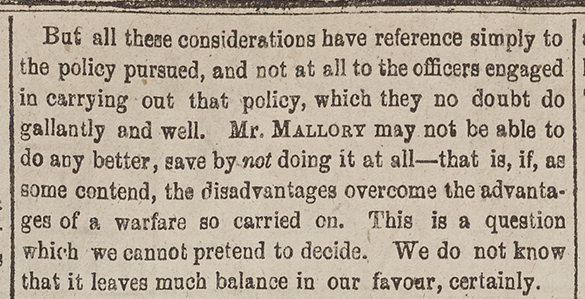 Mr. MALLORY may not be able to do any better, save by not doing it at all—that is, if, as some contend, the disadvantages overcome the advantages of a warfare so carried on. This is a question which we cannot pretend to decide. We do not know that it leaves much balance in our favour, certainly. Item Citation: “The Army and Navy, &tc., &tc.” (editorial), The Daily Journal. (Wilmington, N.C.), 11 November 1864. Call number C071 Z, North Carolina Collection, Wilson Library, University of North Carolina at Chapel Hill. This entry was posted in North Carolina Collection and tagged Confederate Army, Confederate Navy, CSS Albemarle, CSS Tallahassee, jealousy, Plymouth (N.C.), Stephen R. Mallory, Wilmington (N.C.) Daily Journal. Bookmark the permalink.